Carmel City Attorney Glen Mozingo just can’t seem to stop himself. In the midst of protracted controversy over the accuracy of the resumé Mozingo used to obtain the city position, a British website has published biographical information presumably prepared by Mozingo that modifies one of his key claims while continuing to overstate some of his credentials. For instance, the first paragraph of the item posted on the Law Society of England and Wales website says Mozingo has been recognized as a “distinguished international and domestic lawyer by the American Expert Network.” However, a Google search and a search of various professional directories turn up no signs of an American Expert Network. There is an American Network Expert but it is a computer company in New Jersey. On the Law Society website, he now modifies the claim, saying instead that he had received a “Gold Medal by the Republican Party” in recognition of his work “negotiating legislative proposals” for congressional conference committees. He had previously reported receiving other GOP awards for the same work, awards generally given as thanks for campaign contributions. If there is such a thing as a Republican Party Gold Medal, the party keeps the details under wraps. 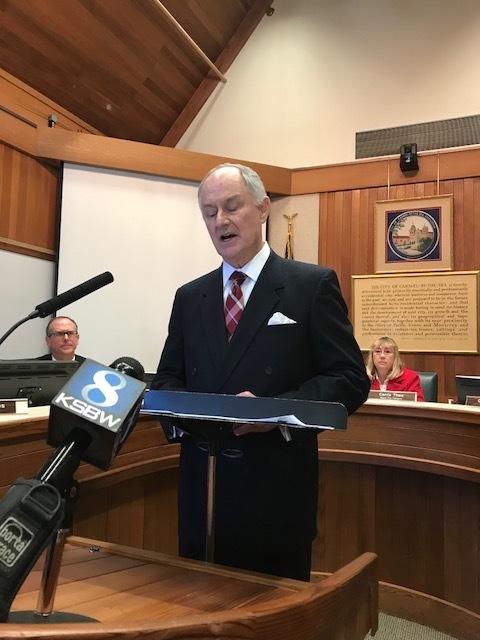 After Voices published articles questioning his various claims, Mozingo met in closed session with the Carmel City Council in July to share various pieces of paperwork in an effort to document his credentials. Afterward, the council declared that they had determined his resumé to be completely accurate and the Voices articles to have been libelous. At Mozingo’s urging, the council had been scheduled to meet in closed session again Wednesday (Sept. 26) to consider appealing the ruling by Judge Robert O’Farrell. That special meeting was canceled without explanation but the topic remains on the agenda for a council meeting Monday. Mozingo told people today’s session was canceled because the court has not yet signed the final order. 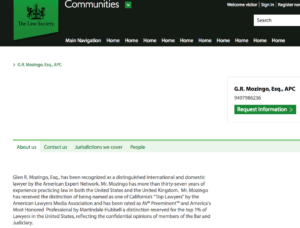 On the Law Society website, Mozingo continues to claim he is licensed to practice law in the United Kingdom, though the Law Society, the British bar association, says it has no record of professional membership for Mozingo. For purposes of posting biographical and promotional materials, the Law Society website is open to all comers but posting of their biographies does not signify membership in the British bar, according to a Law Society spokesman. At the bottom of Mozingo’s Law Society bio is an important bit of info. It asks if he is SRA regulated and it gives the answer. No. SRA stands for the Solicitor Regulation Authority. It is the British bar, the body that decides whether one gets to practice law in the UK. Mozingo says he is a solicitor. What the website is saying is that he is not. The website also says that Mozingo received a postgraduate diploma in international law from Oxford University, which is what theoretically would enable him to practice law in the United Kingdom. A representative of Oxford said earlier this year that the prestigious university does not offer such a degree. Another representative said more recently that the university offers single extension-style courses on various subjects such as international law and that certificates of completion are be awarded. Such certificates do not constitute diplomas or degrees, he said. 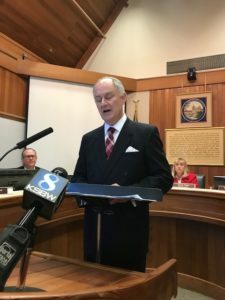 Over the objections of two previous mayors and several other Carmel residents, the City Council last month granted Mozingo a five-year contract to provide city attorney services with the assistance of two deputies, Jon Giffen and former City Councilman Gerard Rose. At the time, Mayor Steve Dallas enthused about Mozingo’s promise to work exclusively for the city, unlike previous city attorneys who had represented other clients. The Law Society website shows, however, that Mozingo remains in the market for additional clients. It says that earlier this year he joined a panel of attorneys available for hire to provide estate planning or other legal services to members of the union representing Los Angeles Police Department officers and sergeants. Mozingo’s father, the late Glen Roy Mozingo, was a Los Angeles police detective until his retirement in 1972. Mozingo says on his resumé, and again on the website, that he served for eight years as special counsel to the late Daryl Gates while he was chief of the LAPD. Attorneys working for Gates at the time say, however, that they have never heard of Mozingo, and Gates’s family says Mozingo’s work was limited to some estate planning. City finance and personnel records dating to well before Gates became chief contain no record of any payments to any Mozingo other than the attorney’s father. THE LOCAL ANGLE: Speaking of Carmel, former Carmel Councilwoman Victoria Beach is all over the news this week because she was a dorm-mate and friend of Judge Brett Kavanaugh accuser Deborah Ramirez at Yale. Beach, class of ’87, was a political philosophy major and interacted with Ramirez on an almost daily basis. She is one of many Yale students who have written letters of support for Ramirez. Beach was interviewed by the New York Times on Wednesday and told the Yale Daily News that she recalls that Ramirez’s closest social circle partied often with Kavanaugh’s group. She said she had not been aware of the incident Ramirez describes involving Kavanaugh but remembers Ramirez as a “lovely and kind person.” Beach said CNN was trying to arrange an interview with her but she was undecided. Great update and summary of the ludicrous situation in Carmel. Evidently “due diligence” is not a term recognized by those in charge of HR for Carmel. A great piece of investigative journalism. Ditto. I don’t know the man, but I am truly puzzled as to why he would continue with the deception that you first uncovered. Maybe he’s like Judge Kavanaugh— believing he’s entitled to the job and owes no one any explanation.